Frankie Valli and The Four Seasons performed Saturday, Feb. 9, 2019, at the Hard Rock Casino in Atlantic City, N.J. 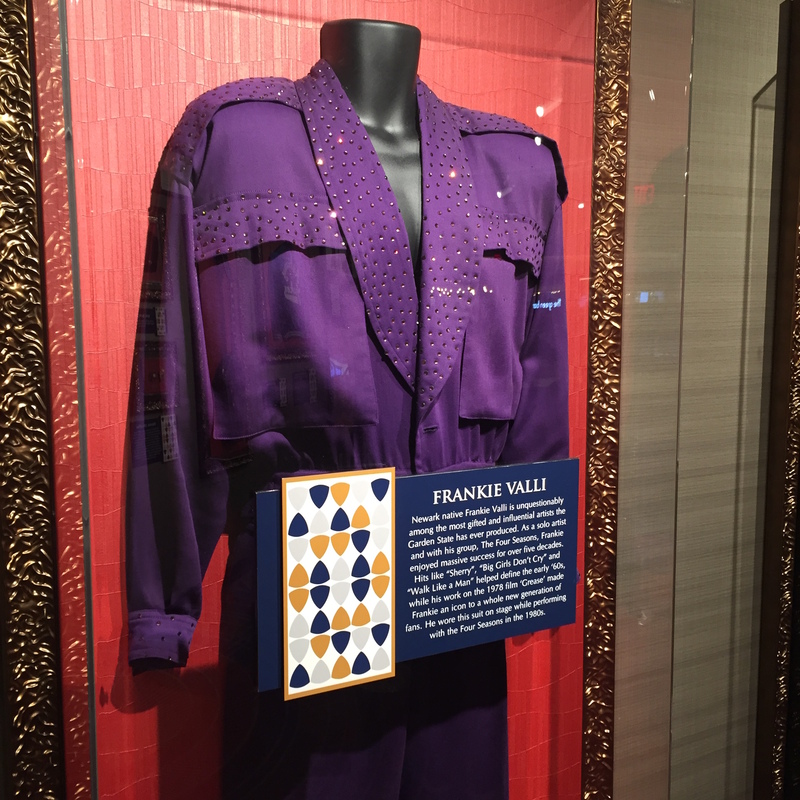 While sitting around killing time, people watching and shooting the breeze before the Frankie Valli concert Saturday night, Feb. 9, at the Hard Rock Casino in Atlantic City, it occurred to me that we were about to witness a quintessential New Jersey event. Here was the original Jersey Boy performing at a casino in the state’s premiere entertainment town, a town in which he’s played for nearly 60 years. It’s as classic a scene as the Rat Pack playing the Sands in Las Vegas in the early 1960s. 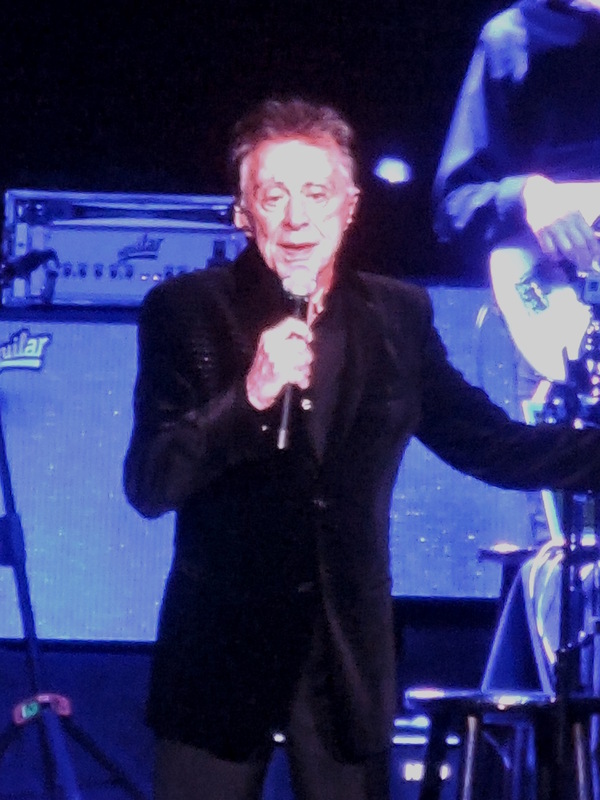 If you’re gonna see Frankie Valli live — especially for the first time like we were — what better place than at a casino in Atlantic City, N.J.? So I said to The Blonde Accountant, “Why wouldn’t the cast of The Sopranos show up tonight to support one of their own?” Given that the iconic HBO series about a New Jersey crime family has now joined the ranks of all things Jersey — Frankie Valli and The Four Seasons, Bruce Springsteen, Stevie Van Zandt (Sopranos character Silvio Dante), Jon Bon Jovi — why wouldn’t there be the possibility of seeing some famous faces in the audience for this show? That made sense to me. Valli appeared in seasons five and six of The Sopranos as the character Rusty Millio, a capo in the Lupertazzi crime family who is referred to in the series as “The Mayor of Munchkinland” because of his short stature. Valli’s character is eventually whacked in his own driveway in a hit contracted by Tony Soprano (James Gandolfini). 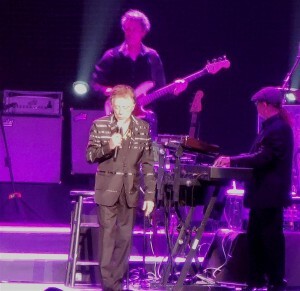 Frankie Valli drew a packed house to the Hard Rock Casino in Atlantic City. Now at 84 years old, Frankie is still worth seeing. His show has a chill-inducing, historical video lead-in of the original group before he and the modern version of The Four Seasons — who by the way are simply fabulous — and the killer nine-piece band take command of the stage and the audience. Wait. What? Ah, somebody is here. Who is it? “I’d like to introduce you to my fellow Sopranos cast member, Tony Sirico,” said Frankie. And right there center stage in the front row, there was Paul “Paulie Walnuts” Gualtieri, dressed impeccably (like his character) in a sharp suit. He stepped up to the edge of the stage and shook Frankie’s hand, turned and briefly acknowledged the cheers from the crowd, and sat back down. Ha! It’s Paulie Walnuts! The soldato, capo regime and underboss of the fictional New Jersey DiMeo crime family, a stone cold gangster and one of Tony Soprano’s closest friends. It was a perfect segue into Frankie’s next comment: “How many of you have seen Jersey Boys?” As was to be expected from a Jersey-centric crowd, there was a big applause. “How many of you have seen Jersey Boys more than once?” Another big response. “How many of you have never seen Jersey Boys?” A handful of claps from the upper regions of the venue. “Get their names and numbers and give them to Paulie Walnuts,” said Frankie, which of course drew the biggest applause of the entire bit. I love it when show business and real life interact like that. 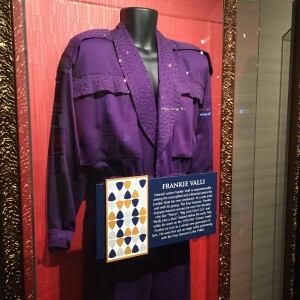 One of Frankie Valli’s stage costumes that he wore during the 1980s, on display at the Hard Rock Casino in Atlantic City. The original Four Seasons — Bob Gaudio, who wrote many of the Four Seasons greatest hits, including “Sherry,” “Big Girls Don’t Cry,” “Walk Like A Man” and “Rag Doll” — Tommy DeVito and Nick Massi (who died in 2000), were inducted into the Rock and Roll Hall of Fame in 1990 and the Vocal Group Hall of Fame in 1999. One of my concerns before the show was that the Jersey Boys Broadway production might be better than the real thing. But seeing Jersey Boys and seeing Frankie Valli and The Four Seasons is seeing two different shows. There’s more storytelling in the Broadway production and more music in Frankie’s show. Both are very good and very entertaining in their own right. In the lead-up to this show, I had watched several YouTube videos of recent Frankie performances, mostly to see if he still had the voice, the one that could hit those trademark high falsetto notes. I’ve seen artists in the past whose voices didn’t stand the test of time — some of my favorites of all-time like Brian Wilson, Art Garfunkel and John Sebastian. It does not bother me that they don’t sound the way they did on the records from the 1960s and 1970s. They’ve made the necessary adjustments the best they can and I just appreciate the opportunity to see them perform. But many of the comments on those YouTube videos, as well as some comments from friends that I received privately, suggested that Frankie has been lip-syncing at his live shows for a while now. I can’t speak authoritatively on that. My seats for this show were too far back to be able to tell, and at those times I was watching the big video screens, I could not discern if it was live or if it was Memorex. Frankie definitely had a live mic, but I am unfamiliar with the technology that allows the seamless blending of live and pre-recorded sound into a show that for all intents and purposes looks and sounds live. I will say this, though: If Frankie was lip-syncing, he’s very good at it. So the quintessential New Jersey event ended up being exactly that. It was pure Jersey and it was a kick to experience. Go see the show if you get the chance. Like Frankie says, you’ll come away thinking the exact same thing as I did: Oh, what a night.